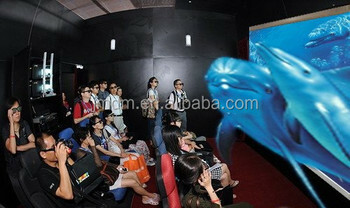 Shenzhen Jingmin Digital Machine Co., Ltd - it is a real vendor who truly masters the 4D/5D movie theater core equipments and control technology, a core and main supplier for 4D/5D movie manufactures or integrators in this industry, a director and creator of 4D/5D core control technology. It owns pneumatic,Hydraulic, electric motion platforms, core control system, key quick editing motion files system. It has supplied core cinema equipments, technology, technology consult and service for almost 70% market shares of manufactures in China and has contributed enormously to the popularization and technology innovation and development of global 4D/5D motion cinema. Our company based on the customers' demands, analyze the strengths and weaknesses of the market across multiple platforms, solid mechanics, software, years of accumulated technology, concentrate on research, has finally launched a cost-effective, highly reliable, rigorous professional 5D pneumatic, hydraulic, electric platform, there are three degrees of freedom, six degrees of freedom. Using advanced hydraulic control technology, superior hydraulic platform devices, to achieve 5D seat any infinite combination of actions, and the 6DOF precision position control of the cylinder. The long service life, high reliability, cost-effective of the product. Overcome noise and energy consumption problems of the pneumatic seat, to solve the electric seat instability and repair inconvenience, to make the theater more energy saving and environmental protection, and is more suitable for high-end, valued customer groups and top-level KTV, clubs and other entertainment. JMDM hydraulic 6DOF motion platform and seat characterictic, compare with the industry's low-end hydraulic platform. Common discomfort of low-end pneumatic, hydraulic platform: Plot action has been in the past, and the chair is still moving: Or no matter what the plot's range of motion, the chair is an amplitude tamper with a pass, the audience has been out of situations, only a chair chaos moving easily cause the audience to nausea, vomiting, panic shaking win popular support, a sense of discomfort! Can not really enjoy the high-end, honorable, comfortable entertainment experience! Using accurate automatic synchronization positioning technology make the seat action completely synchronized with the movie situational, comfortable, smooth, 6-cylinder, each of them can be stopped at any position, constitute the endless angles and combined action can create any movie plot realistic; Kind of the industry's most low-end platform, on each cylinder, two actions, the 6-cylinder only combination of 36 actions, simulated action is very limited. Achieve a high-end, comfortable noble class entertainment experience, the audience is completely immersed in the plot of the film, excellent immigration sense and sank sense. be much more! ! ! So you can return the cost very fast! !